For the "smart money", the low volume stock ascent of 2017 and much of 2018 was a welcome opportunity to generate alpha by clustering into a handful of "hedge fund VIP" names - a group which was traditionally headed by FAANGS and other tech names which appeared immune to any economic news or market stress. According to a new study from UBS, with the S&P 500 sliding 1% last largely due to a furious selloff on Thursday and Friday when interest rates spiked, stocks with the highest hedge fund or passive/ETF ownership posted sharp losses that were four times larger. And just as they posted stellar returns on the way up, they are getting punished on the way down, with equity returns inversely tied to their popularity with funds or, as Bloomberg simply puts it, "the more loved by hedge funds or ETFs, the bigger the drop." The broader market selloff, which has been most acute among the widest-held stocks continued on Monday, as the S&P 500 dropped 0.6% for its biggest 3-day drop since June; the Nasdaq is down 1.5% so far today, losing 5% in the past three days, while the NYSE FANG index was the hardest hit, dropping 2.5% on Monday, after its Friday 2.1% loss took it below its 200-DMA. What this means is that what used to work until recently - following the speculative money or riding the passive flows - on the way up, is no longer working, or rather it is if investors are seeking accelerating losses. To Keith Parker, UBS' chief equity strategist, the data highlight an obvious risk: concerted selling, namely the hedge fund tendency to rush for the exits all at the same time even though, as we noted a month ago, hedge fund net leverage has been relatively modest heading into mid-September, as we explained in "Hedge Funds Slash Their Exposure To Stocks At The Worst Possible Time". What followed was, as Nomura's Charlie McElligott previewed, a "melt up" scramble to outperform the market, made all the more aggressive by the sharp underperformance by hedge funds relative to stocks heading into October which forced hedge fund PMs to double and triple down on the highest beta stocks. 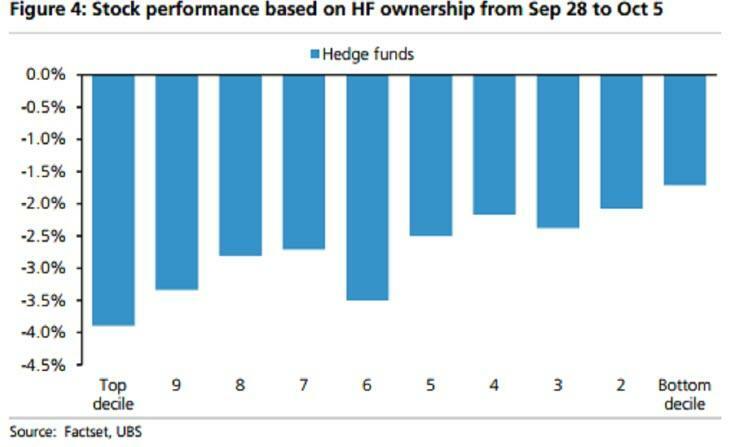 "There has been a notable unwind of hedge fund positioning,” Parker wrote in his latest client note. "Long short hedge fund positioning is more than 3 standard deviation above average, which presents the risk of unwinding further." Making matters worse is that with corporate buybacks now largely in a blackout period, the repurchase bid which has usually provided a buying backstop during sharp selloffs, is missing just as hedge funds and ETF investors ramped up their selling. 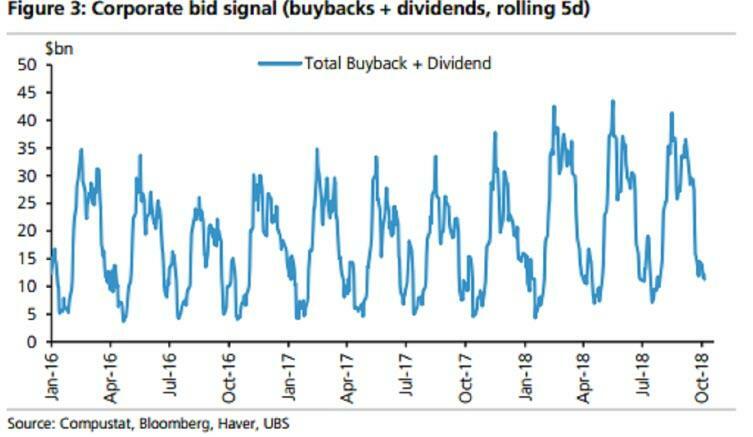 According to UBS data, total corporate demand (buybacks and dividends) for companies fell to $14 billion last week, down from this year’s peak of about $40 billion. This liquidity backdrop may not improve until later this month, Parker warned, which means that a week after stocks suffered one of this year’s biggest declines as 10Y yields surged to a seven-year high at a pace that was comparable to the January rate rout, the selling will likely continue for the next several weeks until a significant buyback bid returns, although should yields continue to rise, even corporate treasurers and CFOs may get cold feet, in which case the market top may indeed be in and the Fed would have no choice but to halt its rate hiking cycle.